The stocks of oil producers working in the Permian Basin of West Texas took a huge hit on Friday as the Street, as two reports—one by Goldman Sachs and the other by boutique brokerage Bernstein—said Permian price discounts would get deeper faster and stay deep for longer. Goldman was talking about oil, and Bernstein was talking about natural gas. It’s a double-whammy for Permian producers, especially for those in the Delaware sub-basin, which is on the western Permian. So while the international oil producers are getting $20/b more now than in Q4 2017, my research shows Permian producers are actually getting less per barrel of oil equivalent (which includes natgas and natural gas liquids)! Over time, Permian wells get gassy, so natural gas is a HUGE part of their realized pricing—and therefore their profitability. Let’s talk oil price discounts first. Permian crude being priced at the Midland hub is now taking almost a $12 per barrel discount from crude priced in Houston (essentially WTI). You can follow that differential through this link. The futures curve shows the differential widening in the coming months. With WTI also trading at a $12 differential it means that Permian producers are getting a price that is $25 per barrel less than the global Brent price. Goldman expects these wide Midland differentials to be a medium-term problem–about 18-20 months. They suggest it’s possible that some unhedged producers could shut in production for a short time in 2019 until the new pipeline capacity is online. If they don’t, they will be forced to use trucks, which have a transportation cost of $12-$13/barrel. And they threw out a crazy statistic–there are now 35,000 trucks used by the industry in the Permian, and continued production growth would require another 4,000. That’s a HUGE number! 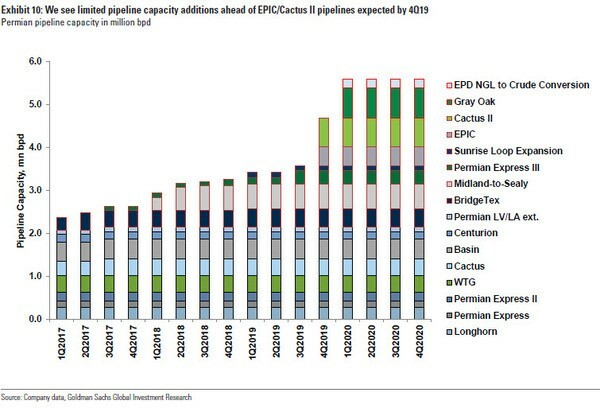 Significant takeaway relief isn’t coming until Q4 19 through a combination of the Cactus 2, Gray Oak and EPIC pipelines. It isn’t just a big discount on oil sales that Permian producers are facing in the months ahead. Now let’s talk about natural gas price discounts because of pipeline constraints. The widening of natural gas differentials is a big deal in the Permian because production here gets gassier as wells age. That is another dent to cash flows which once again pushes up balance sheet leverage. Bernstein issued a report showing the Waha-Nymex Henry Hub price differential blowing out to as much as $1.60/mcf by mid-2019. 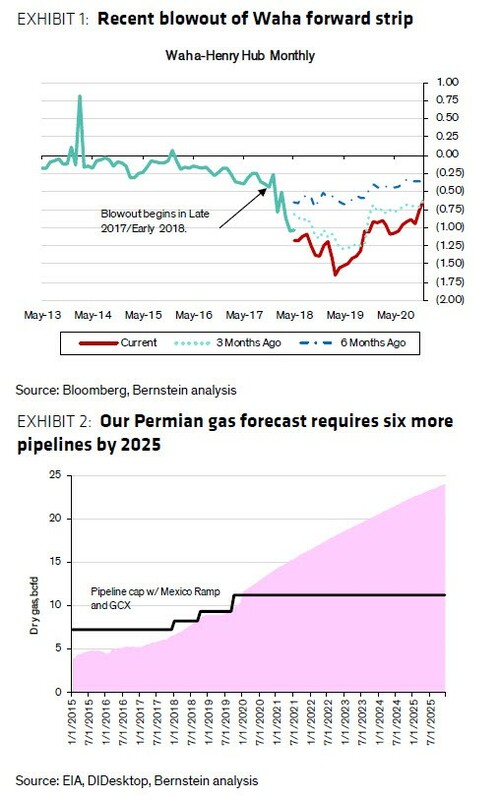 That means if Henry Hub is $2.50/mcf next May, Permian producers would get 90 cents under Bernstein’s hypothesis. Bernstein estimates that at least six new major natural gas pipelines are going to need to be built by 2025. Why that many? Bernstein used theirs and Rystad’s research to come up with Year End 2017 natgas production in the Permian at 6.491 bcf/d—but by YE 21, they expect that to grow to 12.4 bcf/d—a 91% increase in just four years. 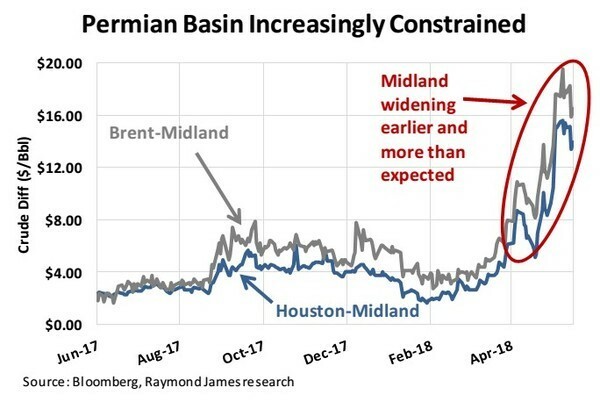 This may not fundamentally impact a lot of Permian producers this year, as most in the basin have hedged a lot of production for 2018 and 2019 (and a lot of those hedge books are WAY underwater at $70 WTI, but that’s for another story). But from a stock perspective, deeper discounts or “diffs”—for differentials, as the industry calls them—is bad news for all Permian stocks. 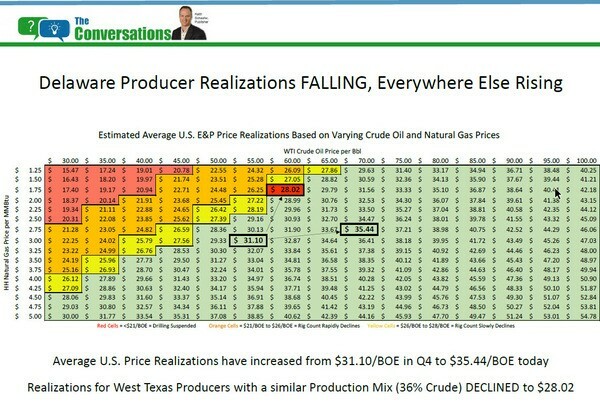 Remember the pricing discounts in the Bakken starting in 2012? They hit over $20/b for over a year, and while crude-by-rail helped, it wasn’t until the Dakota Access Pipeline in 2017 that Bakken traded at the same price (or sometimes higher) than Texas-based WTI pricing. That was 5 years of discounts. Because the new oil pipelines required in the Permian are all within the state of Texas, Goldman noted that they don’t see any challenges in getting them built–unlike in Canada, or Applachia. They expect the Permian oil discount to end in 2020, and “diffs” to go to zero. But for now, a lot of investment has already moved out of the Permian into select Bakken stocks like Whiting (WLL-NYSE) and Continental (CLR-NYSE), which have been stellar performers in the last three months. By the way, the Market and the industry has known what take-away capacity there has been for oil and natgas for years…but they have not been able to plan well enough in advance. With no pipeline relief coming until late 2019 investors should be clear on which Permian producers are most exposed. As I said, many companies have hedged away much of the differential risk or have firm transport commitments that provide endpoint pricing. Those best positioned would include WPX Energy (WPX-NYSE), Pioneer Resources (PXD-NYSE) and Parsley Energy (PE-NYSE) which have almost all production protected through the end of 2019. The Permian focused producers most exposed are Diamondback (FANG-NASDAQ), Matador (MTDR-NYSE) and Cimarex (XEC-NYSE) all of which are going to be taking Midland pricing for the majority of their Permian production. Oil discounts for 18-20 months. Natgas discounts for potentially longer. Lower pricing and profitability. All of it is starting to cool the red-hot Permian for energy investors. EDITORS NOTE–There is an under-the-radar oil producer–outside the Permian–that is among the most profitable in the United States right now. Its stellar growth is now funded, and the management team has made billions for investors in their previous companies. Get ready to hear all about this money making machine in a week’s time.